My wife Carol and I decided that for this Christmas we’d only get each other one present. She got a treadmill and I got a bread knife. They’re not exactly equivalent price-wise, but both of us use both of them, so it all works out. My new knife is a 10 1/2 inch MAC Bread/Roast knife, purchased from The Epicurean Edge. Carol works with a guy that buys so many knives that he’s on a first name basis with the people who run the Epicurean Edge. Knowing that Carol was looking for a new bread knife, he called them up and they suggested the MAC. 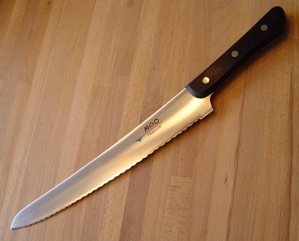 It’s a great knife: sharp, well-balanced, and it cuts through a loaf of bread like, well, a hot knife through butter. Our old bread knife–part of a set of cheap Farberware knives that I bought from Target when I moved into my first apartment–was not a great knife. Cutting through a crusty loaf of the Macrina Bakery’s Guiseppe bread we pick up at the Metropolitan Market would require considerable and rather forceful sawing, resulting in a crushed, misshapen bread slice. The new knife practically cuts the loaf just by looking at it, intimidating the bread into falling into even slices. I like it.